NASA's Mars Odyssey spacecraft will reach a major milestone June 23, when it completes its 60,000th orbit since arriving at the Red Planet in 2001. Odyssey, which discovered widespread water ice just beneath the surface of the Red Planet, is still going strong today, serving as a key communications relay for NASA's Mars rovers and making continued contributions to planetary science. "The spacecraft is in good health, with all subsystems functional and with enough propellant for about 10 more years," said David Lehman, project manager for the Mars Odyssey at NASA’s Jet Propulsion Laboratory (JPL) in Pasadena, California. Odyssey's major discoveries began in the early months of its two-year primary mission, with gamma-ray and neutron measurements that indicated plentiful water ice just beneath the surface at high latitudes on Mars. The spacecraft's unexpectedly long service has enabled achievements such as completion of the highest-resolution global map of Mars and observation of seasonal and year-to-year changes, such as freezing and thawing of carbon dioxide. "Upcoming observations will focus on what is happening in the Martian atmosphere in the morning, such as clouds, hazes and fogs, and on frosts on the surface that burn off by later in the day," said Jeffrey Plaut, Odyssey project scientist at JPL. "We have performed many orbit maneuvers over the long life of this mission, and we will use that experience conducting the one to halt the drift," said Steve Sanders, Odyssey spacecraft engineer at Lockheed Martin Space Systems in Denver. To date, Odyssey's Thermal Emission Imaging System (THEMIS) has yielded 208,240 images in visible-light wavelengths and 188,760 in thermal infrared wavelengths. THEMIS images are the basis for detailed global maps and identification of some surface materials, such as chloride salt deposits and silica-rich terrain. The infrared imaging also indicates how quickly regions of the surface cool at night or warm in sunlight, telling researchers how dusty or rocky the ground is. Odyssey's three-instrument Gamma Ray Spectrometer (GRS) suite detected significant amount of hydrogen on the planet -- interpreted as water ice hidden beneath the surface. This discovery prompted NASA to send its Phoenix Mars Lander to an arctic plain on Mars in 2008, where it examined the water ice detected by Odyssey. The spectrometer suite also mapped global distribution of key chemical elements, such as iron and potassium. The University of Arizona, Tucson, headed its development. Two GRS instruments are still active: the high-energy neutron detector from the Russian Space Research Institute and the neutron spectrometer from Los Alamos National Laboratories in New Mexico. As a communications relay for NASA's Mars rovers, Odyssey has transmitted to Earth more than 90 percent of the data received from the Opportunity rover. Future plans for Odyssey include relay duty for NASA and European Space Agency landers arriving on Mars in 2016. Odyssey launched on April 7, 2001 from Cape Canaveral Air Force Station, Florida. JPL manages the Mars Odyssey Project for NASA's Science Mission Directorate in Washington. Lockheed Martin built the spacecraft and collaborates with JPL in mission operations. Arizona State University, Tempe, provided and operates THEMIS. 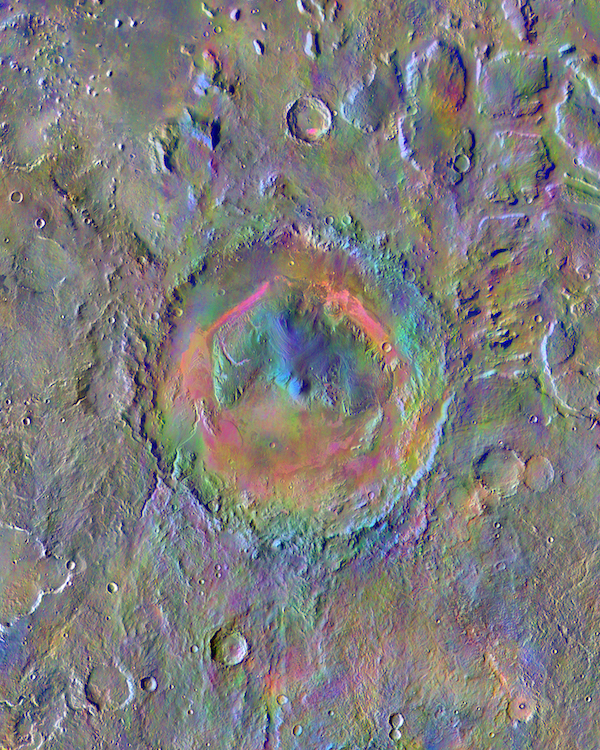 Gale Crater, home to NASA's Curiosity Mars rover, shows a new face in this image made using data from the THEMIS camera on NASA's Mars Odyssey orbiter. The colors come from an image processing method that identifies mineral differences in surface materials and displays them in false colors. Seen shortly after local Martian sunrise, clouds gather in the summit pit, or caldera, of Pavonis Mons, a giant volcano on Mars, in this image from the Thermal Emission Imaging System (THEMIS) on NASA's Mars Odyssey orbiter.